Functional, combat ready Celtic Long Shield is covered with real rawhide leather. ½ inch thick plywood construction, wooden and steel shield boss. Edges are lightly padded leather, reinforcement plates and wooden handle. Functional combat ready Celtic Round Shield is highly decorated with Celtic knotwork designs. Plywood construction ½" with riveted 17 gauge steel reinforcement plates. The Kite Shield has a Plywood construction with bolted metal rims, central boss, padding for your hand and heavy-duty leather straps. Hand painted. Rugged hand-made Fantasy Steel Shield, completely functional, combat ready. 16 gauge steel with a steel hand grip, padding and heavy duty enarms. Classic knights shield or Heater Shield is combat ready and built to withstand the heavy abuse from European Live Steel Re-enactment groups. Crusader Shield or Heater Shield is combat ready and built to withstand the heavy abuse from European Live Steel Re-enactment groups. 14 Gauge Steel with reinforced trim. 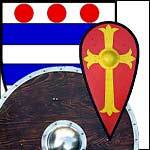 Round Shields would work for Viking, Norman or Saxon period re-enactments. Plywood construction, bolted metal reinforcement plates and central boss. The Norman Shield is a Plywood construction 3/8" with bolted metal rims, central boss, padding for your hand and heavy-duty leather straps. Our Medieval Heater Shield is a very durable Battle-ready shield for practical use in LARP, historical reenactments and HEMA (Historical European Martial Arts). Available in 3 different sizes. Shield Boss is Now available with a larger dome for armored hands, this shield boss is ideal for the re-enactor crafting his own wooden shield. Shield Boss is Now available in stainless steel with a larger dome for armored hands, this shield boss is ideal for the re-enactor crafting his own wooden shield. Rugged hand-made Viking Round Shield is completely functional, combat ready. Plywood construction, bolted metal reinforcement plates and central boss. Leather covered steel hand grip. A simple 14 gauge Steel Shield Boss for attaching to your shield. This version of a Renaissance Steel Buckler comes with a steel grip, central boss, reinforcing steel bands and rolled and roped edges. Available in 14 gauge steel. Deluxe 14 gauge Steel Shield Boss for attaching to your shield. This 14 gauge steel boss is spun and polished, with pre-drilled attachment holes. Small sized. Our Shield Boss with Hemispherical Dome is ideal for the re-enactor crafting his own shield. 14 gauge steel bosses are spun and polished with pre-drilled attachment holes. Functional and Battle Ready. Our Shield Boss with Conical Dome is ideal for the re-enactor crafting his own shield. 14 gauge steel, polished, pre-drilled attachment holes, Larger for Gloved Hands. Functional and Battle Ready. Rugged Viking Round Shield is completely functional and combat ready. Wood construction with riveted on central boss. Riveted wooden grip, riveted steel rim and large studs. The wood is darkly stained in front and painted black on the reverse.